This story is about a mouse infestation in a space station that is in a struggle to get tourists to visit it. An influential reviewer wrote that this story, (my first pro-magazine publication) was the worst story of the year in Analog Magazine. This was not a pleasant thing for me, a relatively green SF writer, to read. Despite the fact that the most important reviewer was Stan Schmidt, the editor of Analog who bought the story, I was quite discouraged until another well-known reviewer rated the story as very good. Humor is tough to write. The Story appeared in the Jul/Aug 2003 Analog. This story is part of a three story series, all taking place in a space station over Earth. 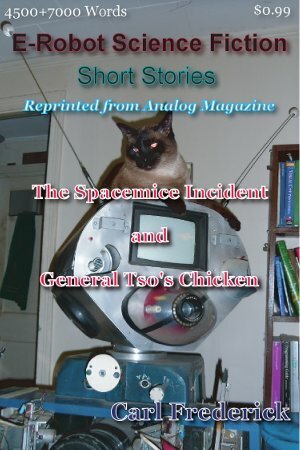 The first story, 'The Spacemice Incident' was my first Analog publication. The last of the series was 'This Little World'. 'General Tso's Chicken' appeared in the March 2005 issue of Analog Magazine.